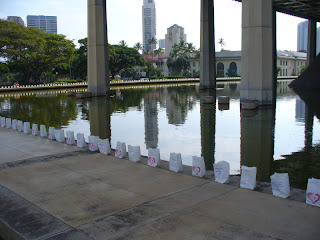 Many, many people attended this years March for Life at the Hawaii State Capitol. 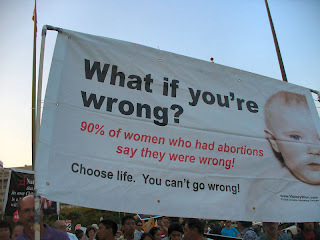 Just like the March for Life in D.C., there were more young people than ever before, standing up for life. 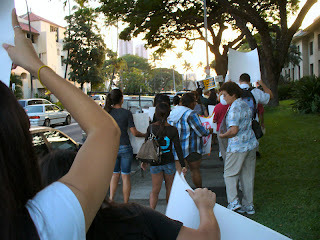 Here are some photos from the rally and March. 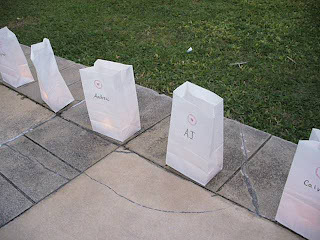 These are the luminaries placed around the capitol which represented a child murdered by abortion. 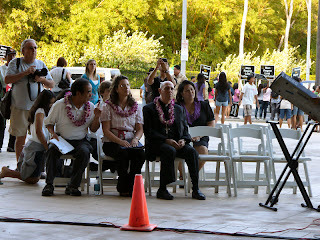 Hawaii's own bishop and his vicar general Father Marc Alexander were there to speak out for life. 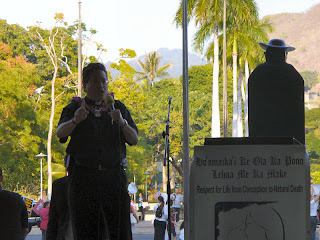 Also featured in the photo below are Dennis Arakiki of Hawaii Family Forum, Karen DiCostanzo, President of Hawaii Right to Life and doctor/singer Malie Lee. 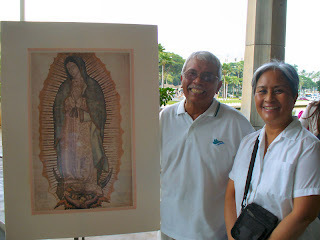 It was most fitting that the image of Our Lady of Guadalupe be present at the March for Life. She is after all, the patroness of the unborn. 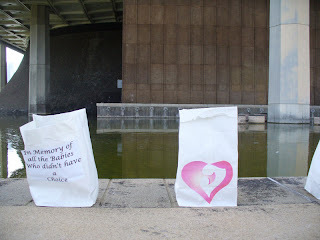 Thank you Venny and Jessica Villapando for bringing both images to the Rally and March. 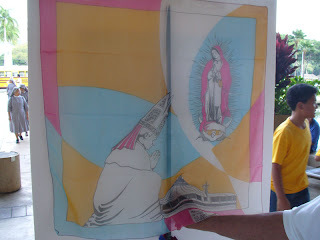 This colorful image of Venerable John Paul II kneeling in front of Our Lady of Guadalupe's image was brought back by Venny and Jessica when they returned home from the canonization of Saint Juan Diego. 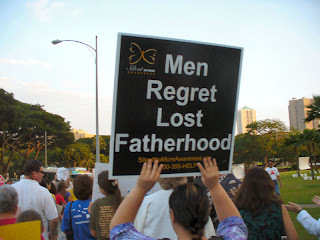 The following are some of the profound messages found at the Rally and March. 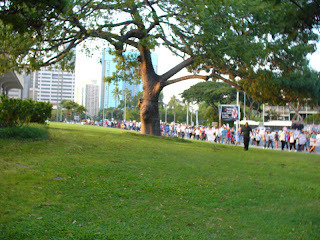 The following are photos taken on the march itself. Archbishop Robert J. Carlson led the faithful on a procession from Cathedral Basilica to Planned Parenthood to give witness to the more than 50 million unborn children who have lost their lives by abortion since 1973. The protesters prayed for the mothers of the unborn children and for our nation in hopes it will adopt public policies that protect life. 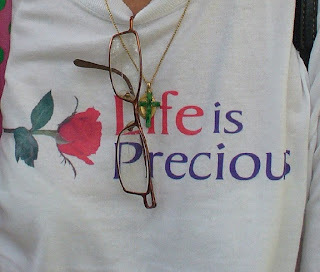 This multimedia slideshow features photographs from the rosary march with Archbishop Robert Carlson with audio interview from Beth Lauver, Director of Respect Life Apostolate for the Archdiocese of St. Louis. 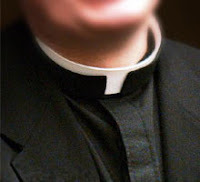 My first impression on seeing our priest vested in purple was "Father, must be confused". No, Father P was far from confused. During his homily he explained to others like myself who were clueless, that he was wearing purple in commemoration of the day that abortion was made legal in the United States. 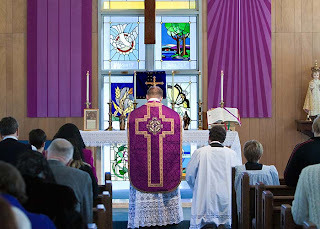 Purple in the liturgical sense stands for penance and purification. 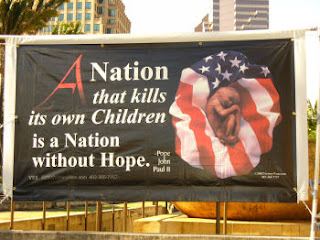 The United States must purify herself for the great sin of abortion and do many, many penances. 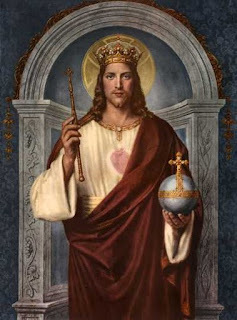 Father then went on to talk about how even though Christianity has some things in common with Islam, such as their great respect for Jesus and His Virgin Mother, the reasons Muslims is at war with America is because in their eyes we are going against God's laws, we are the infidels. 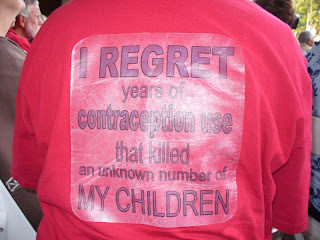 We are a nation that kills it own children. 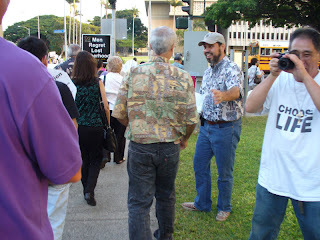 We are a nation that wants to legalize and normalize homosexual marriages. Let this be a wake up call to us Christians living in the United States. Protect and defend what is sacred and that begins with the unborn and with the sacrament of marriage. If, after being admonished once or twice, a person does not amend, do not argue with him but commit the whole matter to God that His will and honor may be furthered in all His servants, for God knows well how to turn evil to good. Try to bear patiently with the defects and infirmities of others, whatever they may be, because you also have many a fault which others must endure. Isn't it just like a human being to try to change others? We try to change the annoying habits of others when if we truly looked into our souls and were more aware of our actions and words, we would see how often our habits are irritating to another person. 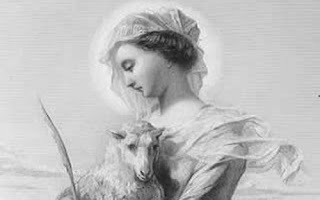 John Keats's poem, The Eve of St Agnes, immortalised the patron saint of young girls. Today, on the eve of her feast day, we explore the legend surrounding the young martyr.